I made some progress on the Chevalet this week, although not all of it is wood related. First off, I got the “saw support arm” completed. This is the three pieces that support the gimbal and saw frame. 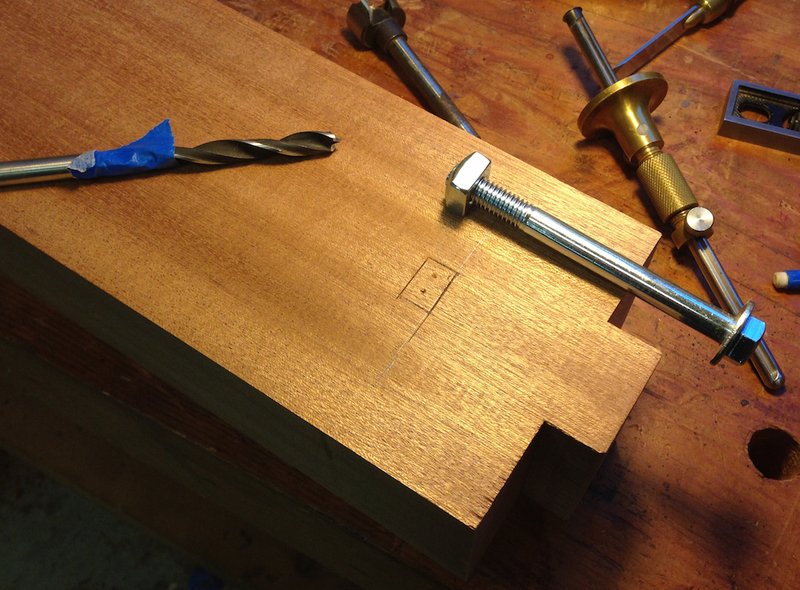 Once I’d wrapped up the adjusters last weekend it was just simple stuff — cut the tenons that fit into the vertical and horizontal adjusters, and add the mounting bolts. The mounting bolts were a bit interesting. 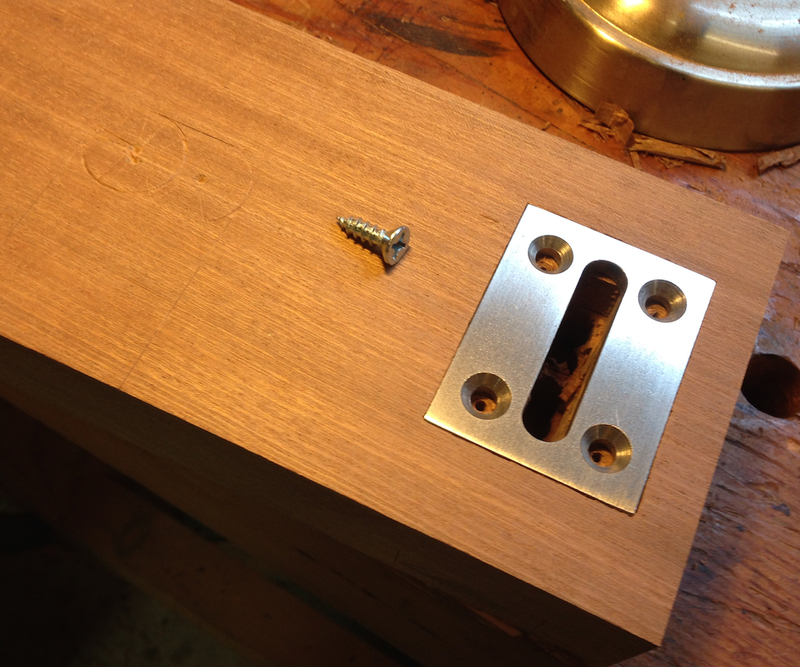 There is a 3/8″ bolt that goes through the adjuster slot into a hole in the end grain of the horizontal support. It needs a nut on the end. The simple thing to do would be to carve out a big hole so I could reach in and put the nut on the end of the bolt. Instead I decided to chop a mortise just the size of the nut so I could drop it in place, and the walls of the mortise would keep it from spinning when I tighten it. That meant I had to be pretty accurate in drilling the hole into the end of the horizontal support, and in laying out and chopping the mortises. It turned out to be pretty simple really, I just had to pay attention to what I was doing. 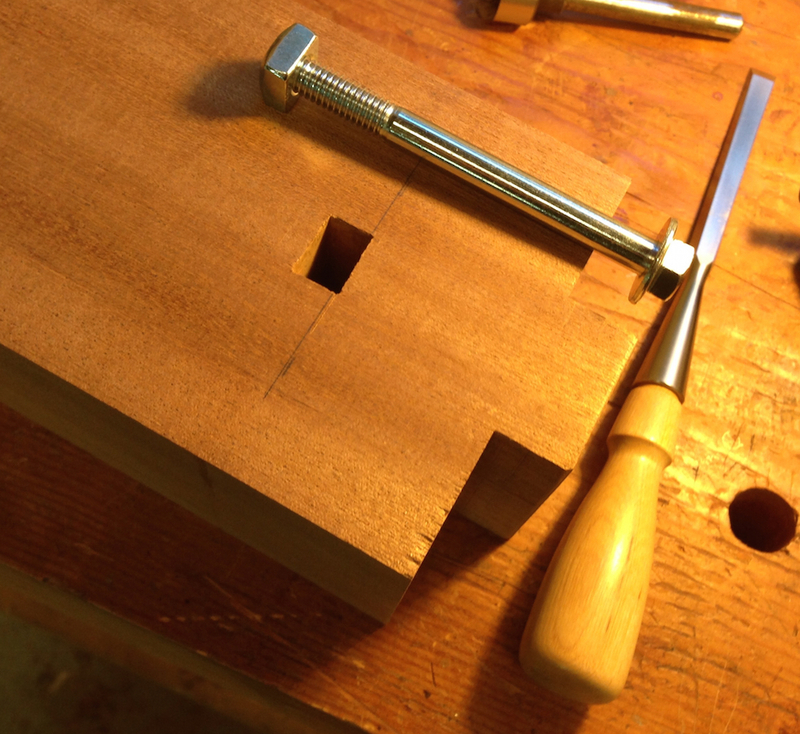 I figured out the “clamping depth” — how far in the nut needed to be — and knifed in a mortise just big enough for a square nut. Then I figured out how deep it had to sit to engage the bolt coming from the end. I set a blue tape depth stop and drilled out most of the waste. Mortise knifed in. The next step is to use a drill to remove the waste, then chop out the rest. That just left chopping out the waste, and paring the fit so the bolt would drop to the right depth. I didn’t want to have to force it down, and risk it getting stuck! The repeat for the other end of the support. That completed the horizontal frame assembly. Mostly. Why “mostly”? Well, attaching this to the frame I’ve built so far required figuring out the length of the vertical riser and where it hits this horizontal member. 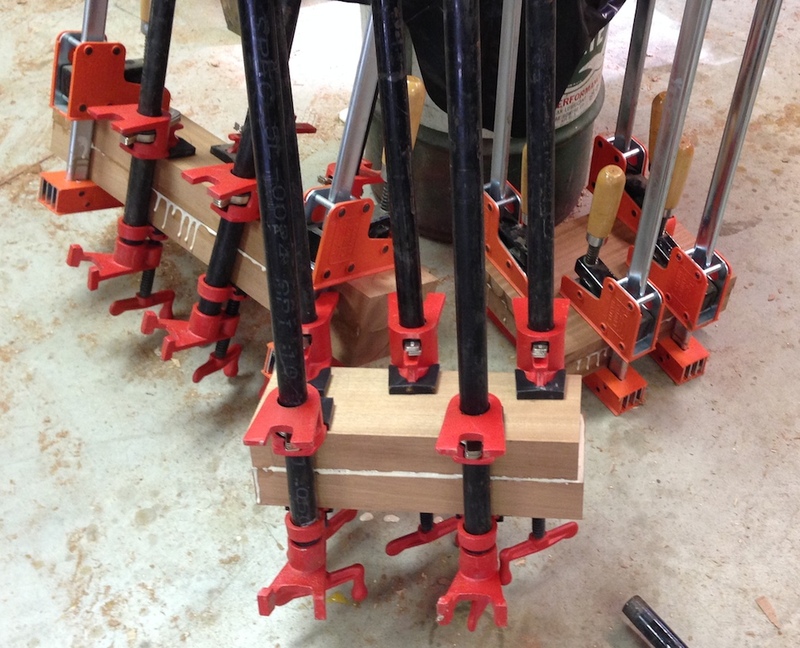 All of this to ensure that the saw frame ends up in the right place relative to the clamping jaws. Unclear on what I’m talking about? The saw hangs from a gimbal mechanism that pivots on the two knobs in the picture above. The saw blade has to end up in the right location, or the saw won’t work, and I’ll just have a large pile of expensive firewood. 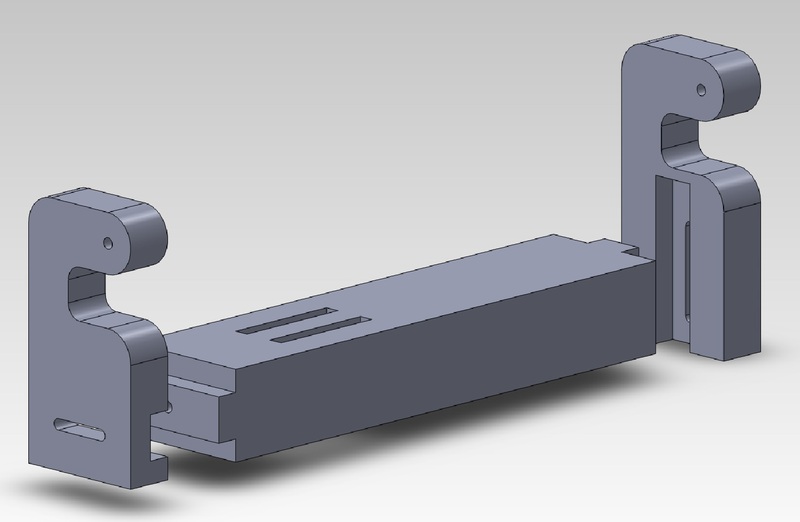 So I pulled measurements from the blueprints provided by Patrick Edwards, and modeled all of the parts so far in SolidWorks. I adjusted the layout for the joinery and the length of the vertical riser until I got the parts in the right location, and then printed out some plans that match the parts and materials I’m using. In theory, I just need to do two joints to complete things to match my model. That shouldn’t take me more than an hour or two, but I spent probably two hours measuring blueprints and re-creating parts in CAD to know where to cut everything. Once that’s done I need to make the seat assembly, and the saw frame. I don’t have enough wood for the seat assembly, and I think I’d like to do that next. The parts I’ve built so far won’t stand up without the seat assembly, and I’m worried about cutting the joint for the saw frame. It’s essentially a giant finger joint, but it’s too big to cut on the table saw, and I’m not confident enough in my hand sawing to be able to saw it. I guess I can do some practicing. 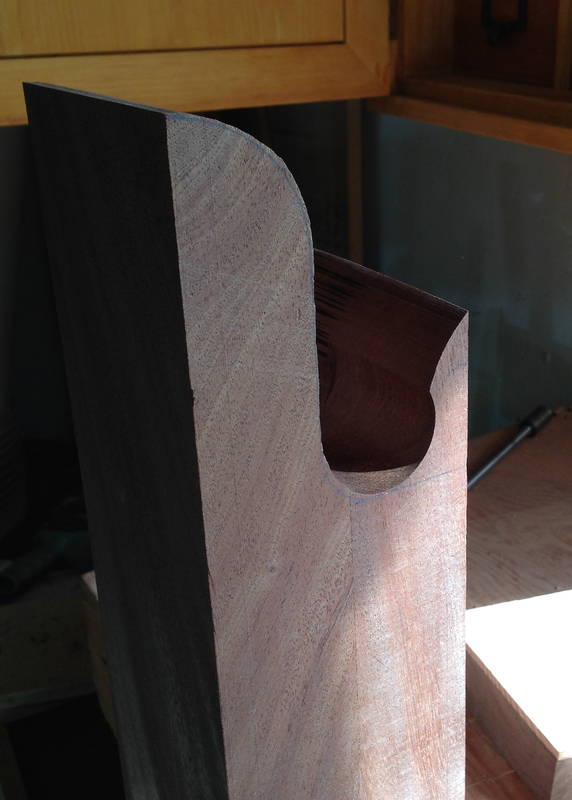 Or maybe do it on the bandsaw. Making the first adjuster yesterday seemed to take forever, like four hours forever. Making the vertical adjuster today took half the time. I can’t decide if it’s because I already had my chisels laying on the bench, or I had headphones on listening to Lightnin’ Hopkins. Either way, I should have time after lunch to make a bit more progress. Add drilling, threading the pivot hole, chopping the mortises, sawing and a bit of tune up with a rasp and sandpaper, and voila!. I’ll go back and round-over the edges once everything is built and test fit. 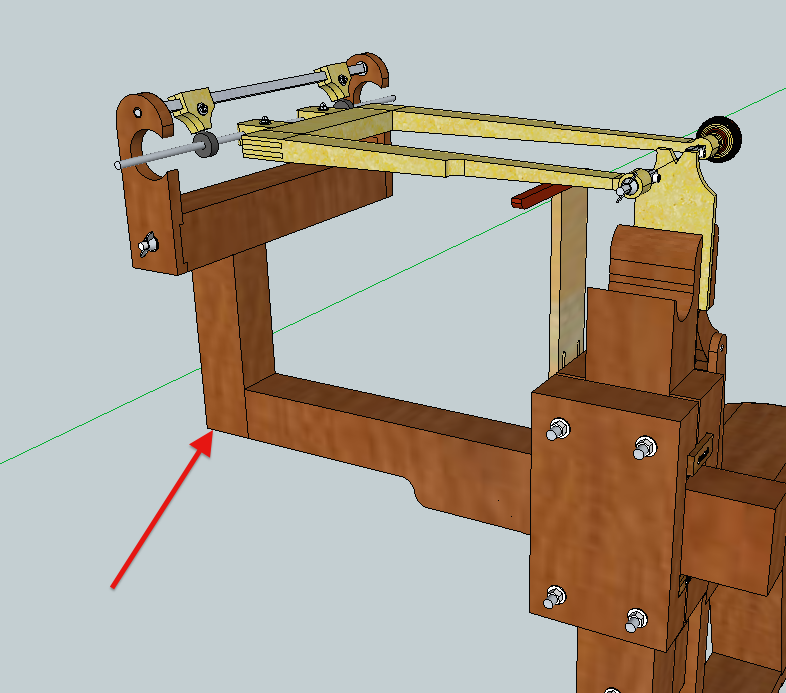 After noodling over the joinery between the horizontal support arm and the vertical riser yesterday I’d realized I needed to make the supports for the saw first and work backwards to that joint so that I ended up with the saw in the right position. 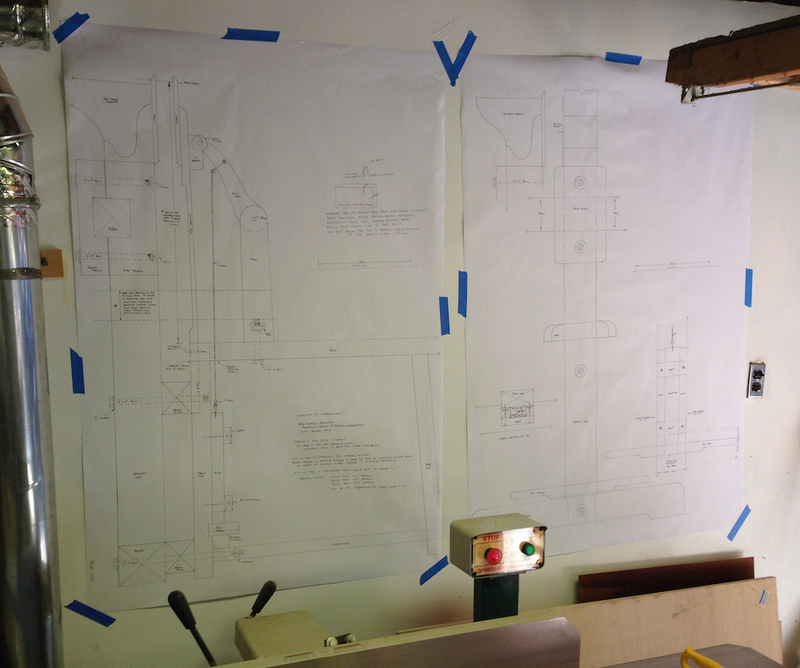 I printed our my measurements and laid out all of the critical bits on my wood for the horizontal adjuster. And realized I had the orientation inverted. Opps. Erase, repeat. The horizontal adjuster goes at the far end of the saw, the vertical at the near. I was thinking I would break out the router to make the adjuster slot and recess for the steel plate, but that just seemed like too much trouble. 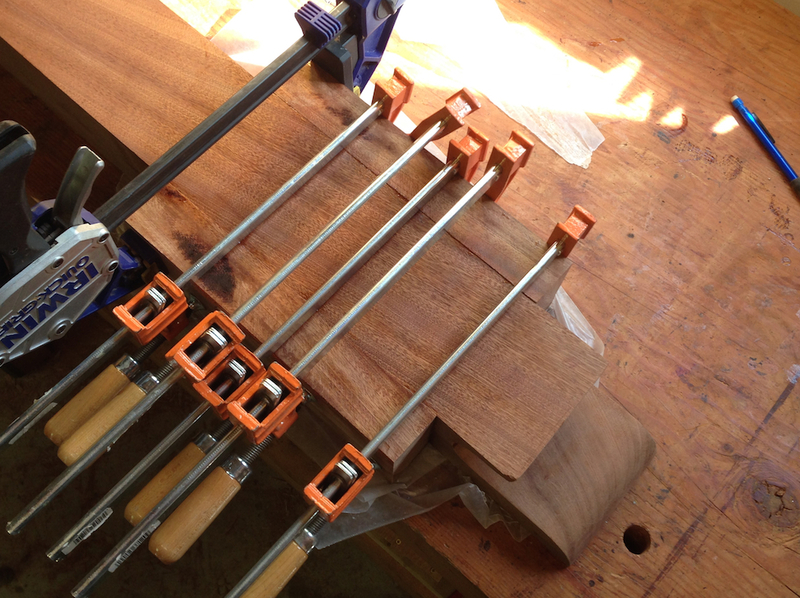 Setting up stops or making a jig. Instead I drilled some ruled to remove the waste for the slip and chiseled it out (only half way through, because the slot for the sliding tenon on the other side will complete it). The picture is fuzzy, but the adjuster slot it clean. 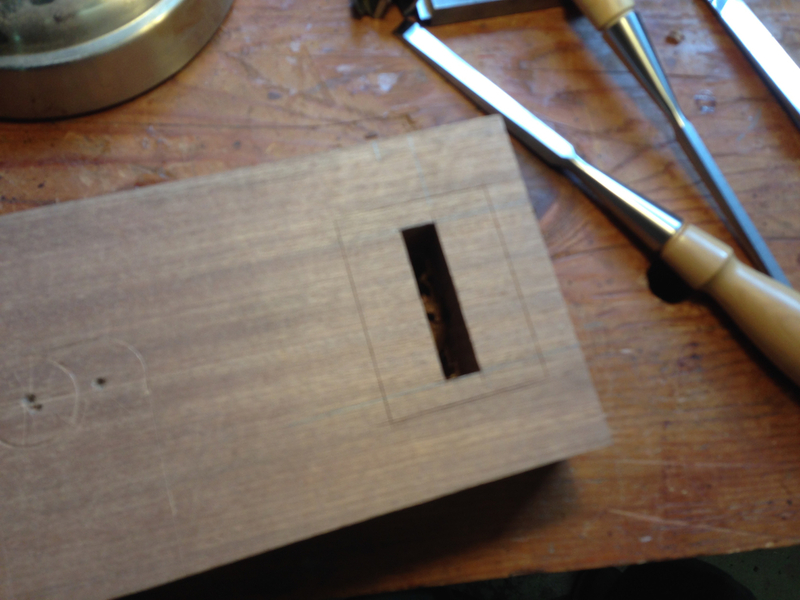 Note that it only needs to be clean down 3/4″ because it intersects the mortise for the sliding tenon on the other side. Then I knifed in the outline for the steel plate, drilled out most of the waste with a Forstner bit, chopped the outline and finished it with my router plane. This was fun. 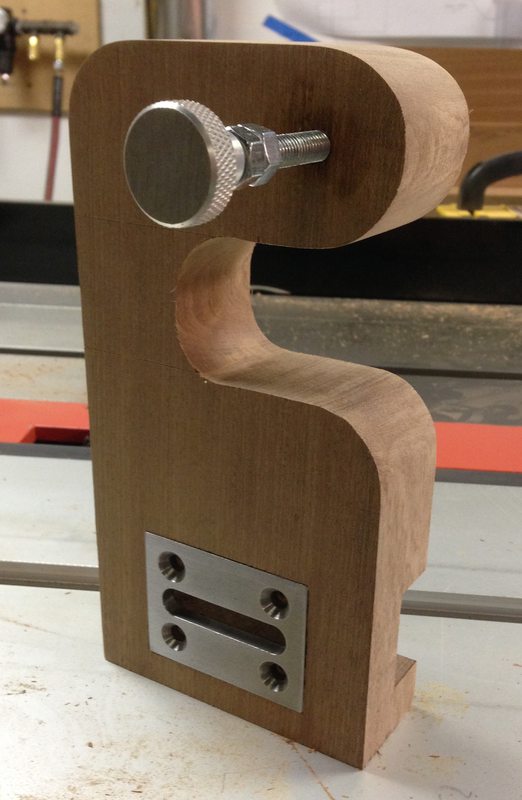 The rest was just drilling/tapping the pivot adjuster hole and sawing out the shape. I tuned it up a little with a rasp. It’s not an elegant shape, but it will be functional. I’ll probably round over the edges and smooth it out a bit more, but first I need to make the vertical adjuster. I’ve been stalled the past couple of days on the Chevalet. The blueprints are missing the level of detail that I tend to put into plans. It’s all stuff you can figure out, but I like to have a specific plan before I start marking out and cutting. 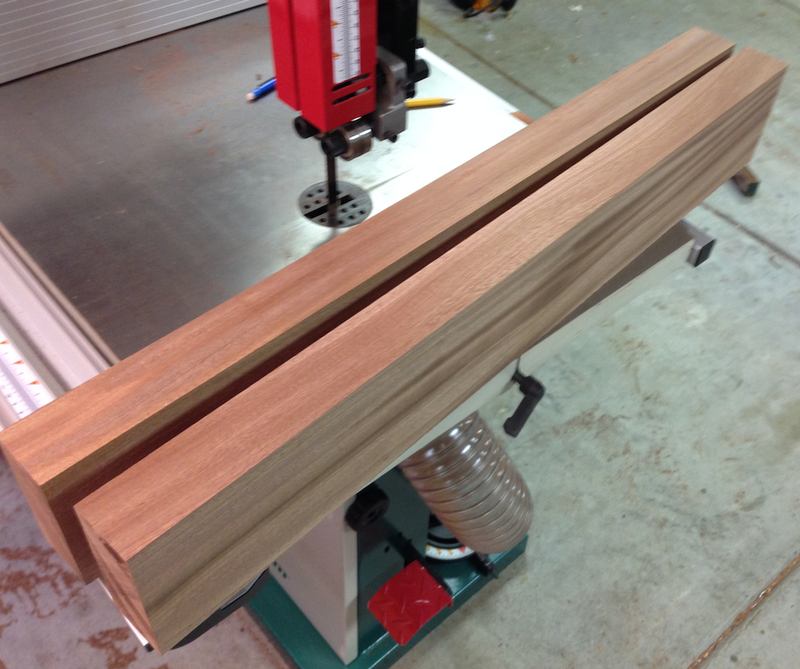 I have all of the “beams” glued up and trued for the saw support arm, and I was going to start with this joint here. In the Chevys at school this was, I believe, a “triple tenon” joint, although that’s not called out in the plans. 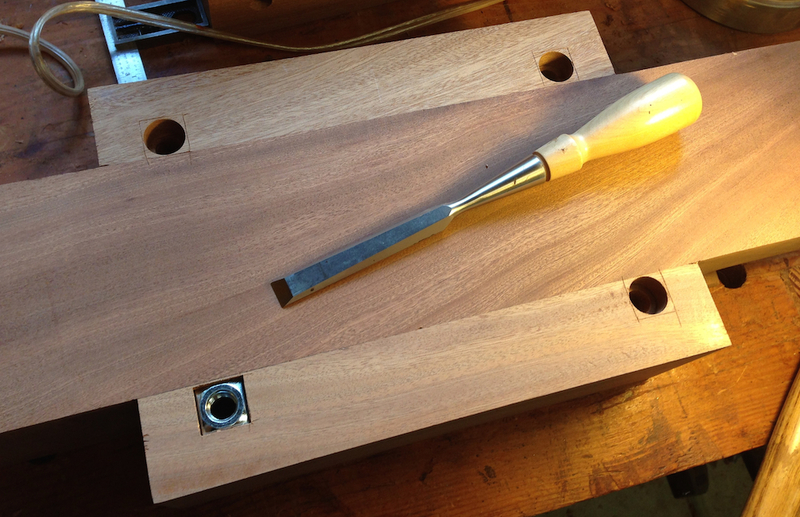 Since my parts are different sizes as a result of working with the wood I have available, I needed to make some adjustments in the joinery here. The horizontal piece I have is a little different in size than the plans too. Crud. Which means that the vertical adjusters on the ends need to be sized differently. In short, I needed to re-design and build from the opposite end of this assembly. I sat down at the computer yesterday and drew of the horizontal arm that supports the saw adjusters, and then drew those up too. I tried to include the critical dimensions from the plans, I need to have the saw itself end up in the same position relative to the vise jaws when I’m done jiggering around with everything. 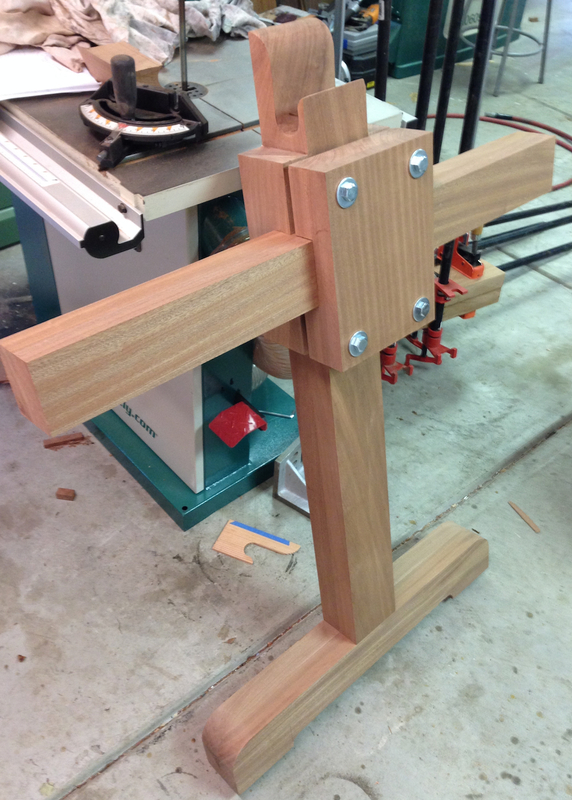 Once this assembly is done I can make the vertical member to ensure this is at the right height for the upright. I’m going to make one more check of the measurements before I lay out and cut the two vertical adjusters and the horizontal piece. 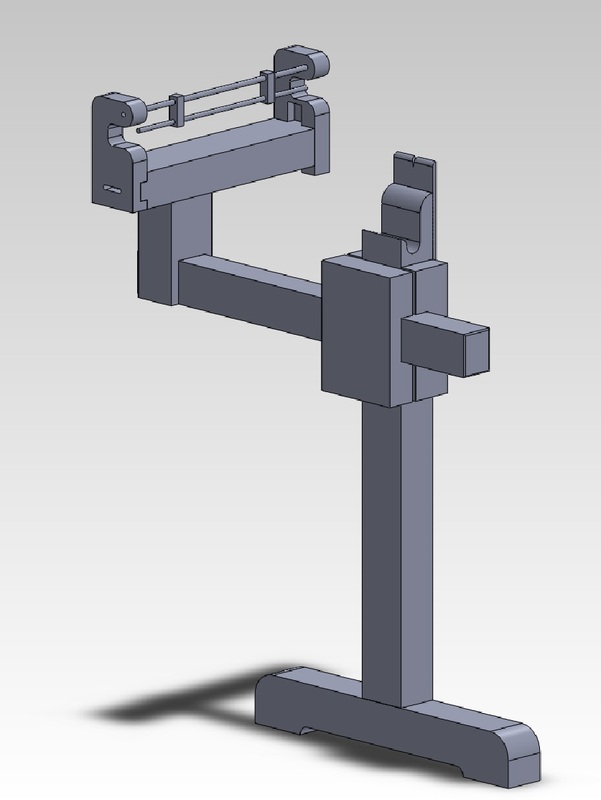 My CAD mockup of the saw support arm, based on the wood I have and the hardware kit. 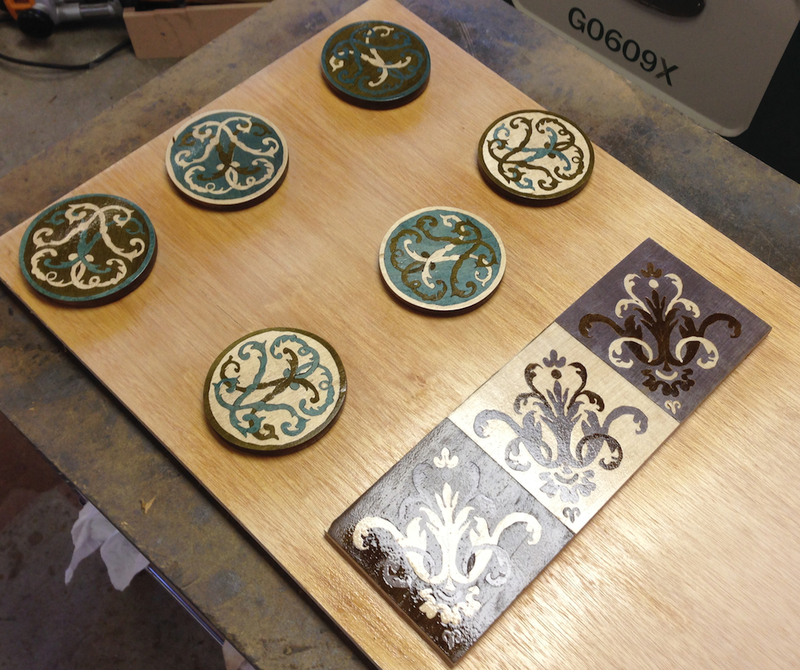 One afternoon at the Marquetry class in San Diego, Patrick called us over to meet a former student, Aaron Radelow. The story he told was amazing; in short he created a perfect reproduction of this reading/writing table that had been built for Louis IV around 1760. The original is in the Getty museum, and Aaron was able to get access to the original to measure it. When he was done he had a perfect replica, and a perfect inverse copy as well. 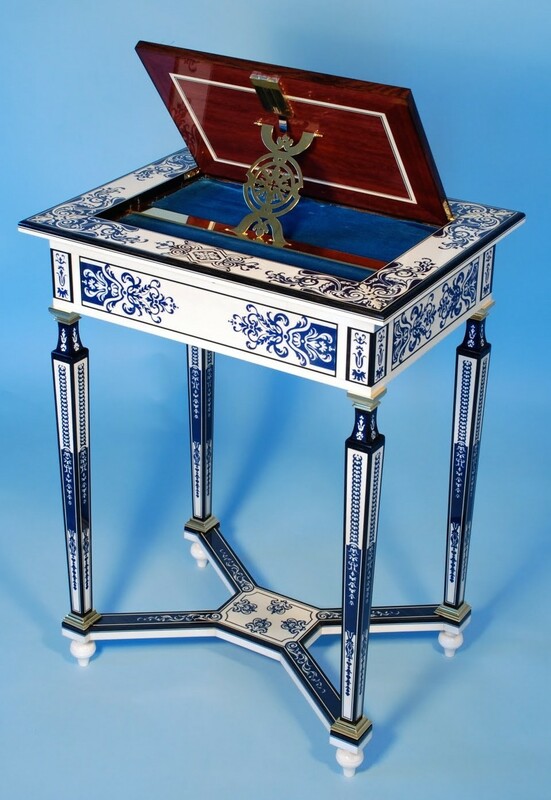 Because this was made with the Boulle method to saw the marquetry parts, the packets that were prepared for each panel had layers of both blue horn and ivory. The resulting parts could then be assembled blue-int0-white and white-into0blue. The link below has more details. Regardless of the style of furniture you like, this is an amazing piece in terms of technical complexity, fine details and masterful execution. 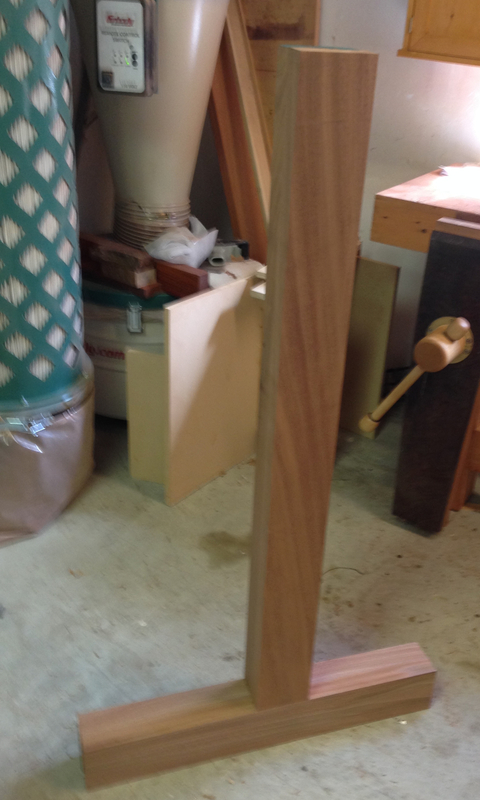 Making the King’s Furniture – videos – Fine Woodworking. The front upright is mostly done! Huzzah! Finishing this part meant I I had to jump ahead and start making the cross arm that will support the saw mechanism so I could get the notch in the clamp mechanism the right size (ish). That’s done, and I’m ready to move on to completing the arm mechanism. 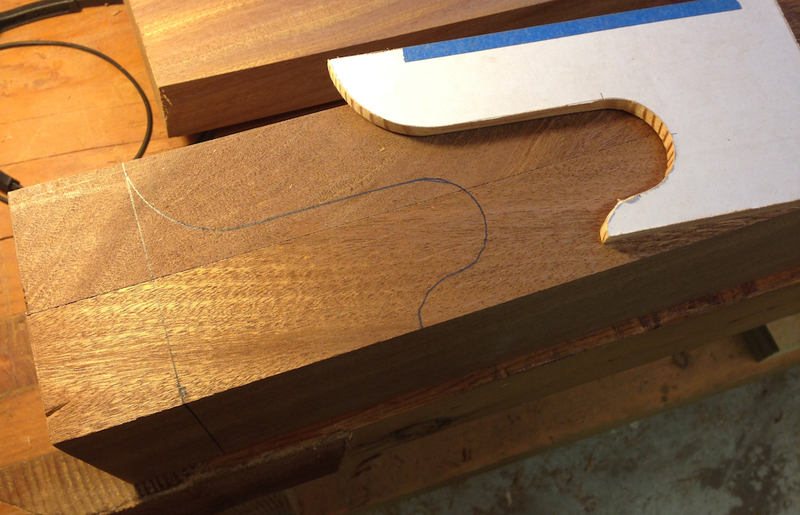 I roughed out this cut-out by first drilling a 1.5″ hole and then bandsawing into it. After this picture I got my rasp out and smoothed it out. The idea of this cut out is to trap parts that fall out of the back of the marquetry packet before they fall on the floor and disappear. Then I laminated on the side blocks. I used Old Brown Glue for this, to avoid messing with the finish. After the glue was dry I planed the surfaces level. 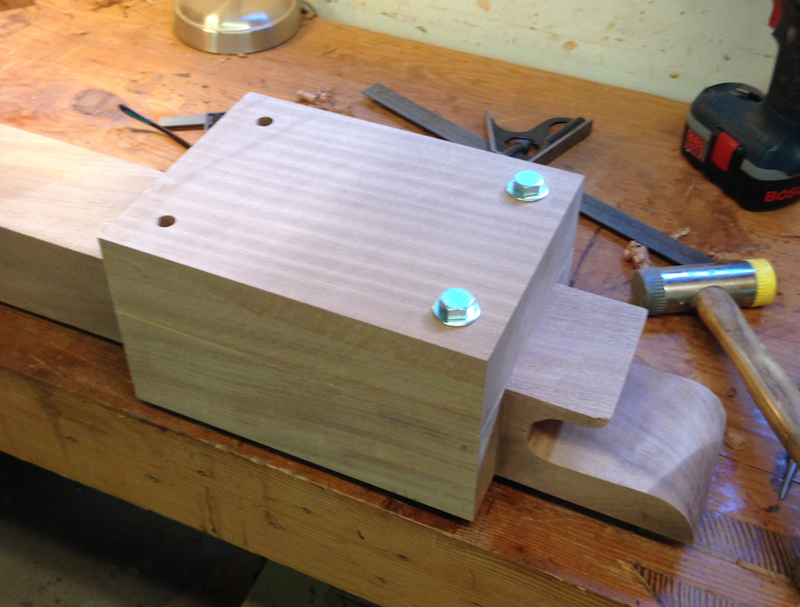 Then I fit the fron clamping block, and drilled the holes for the bolts. The plans only call for two bolts, so I made a trip to the HW store for extra bolts. I knifed in the square nuts on the back. There can’t be any protrusions on the back because it would interfere with the marquetry packet, so these nuts will have to get recessed. 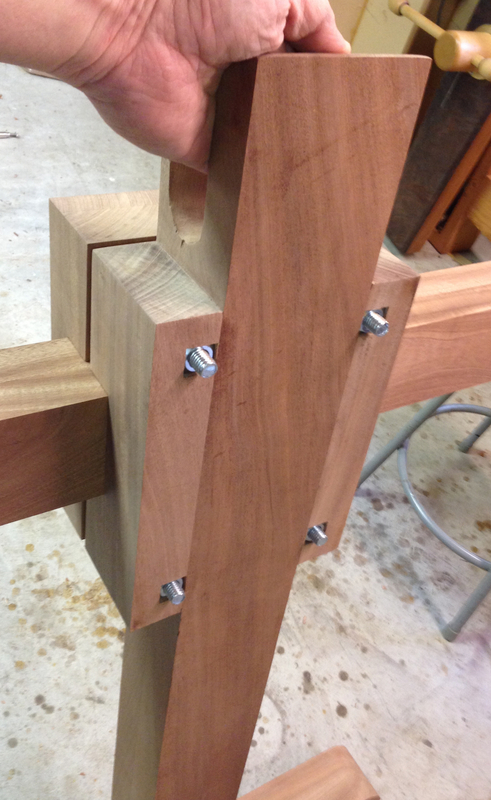 I counterbored the holes with a 3/4″ forstner bit, then chiseled the walls square. This was fun! 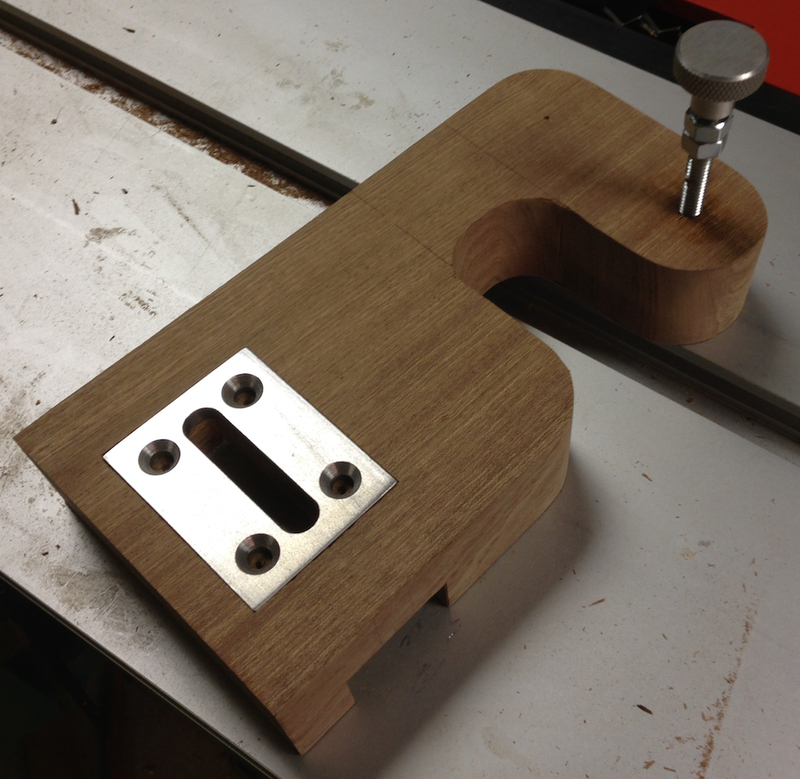 With the nuts recessed I was in the mood for a test assembly so I could see some progress. I’m going to attack this with a round over bit later and knock those sharp edges off. I need to trim the bolts a little bit, about half an inch, so they don’t protrude. I’ve been grabbing little snatches of time this week, making progress on the Marquetry Chevalet. Unfortunately, there isn’t much to show for it. 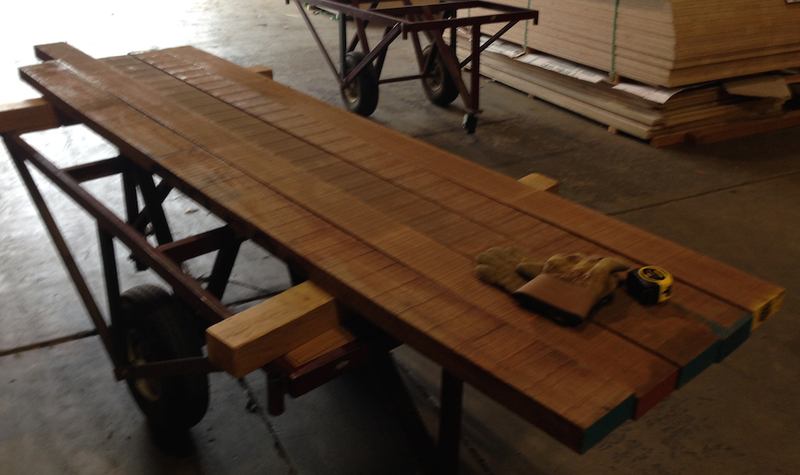 Lots of dimensioning 8/4 rough sawn stock and laminating it to make thicker beams. I decided to “finish” the class exercises from the class I took a couple of weeks ago with Patrick and Patrice at ASFM. My view of these is a little more objective now than when I was at the class. Lots of obvious mistakes, but I’m hopeful that once I get my Chevalet built I’ll be able to work through these again and do a better job, moving on to be able to incorporate marquetry into real projects. In class we assembled the projects face-down onto special French ribbed kraft paper (there is a joke somewhere there, but it escapes me), and packed mastic into the saw kerfs. The the brown smeary stuff you see here. 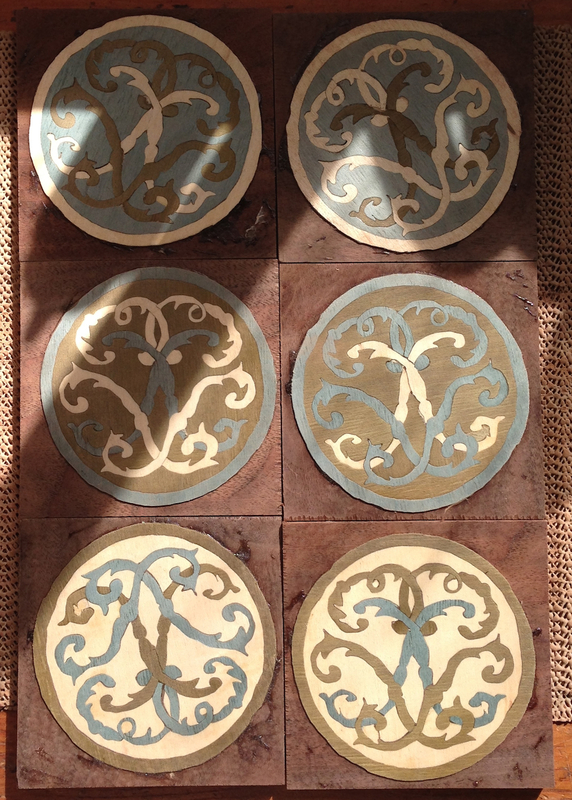 I used Old Brown Glue and clamped the discs to the Walnut bases between waxed paper. Once the glue is dried the process is to wet the paper-covered face and scrape off the kraft paper and excess glue. That always feels a bit dicey, getting enough water soaked in to be able to scrape the paper mache mess off without releasing the veneer from the substrate. But it all worked out OK.
Then I sanded the surface a little and started applying finish. I’m using spar varnish on these because I needed something waterproof and wanted a glossy build up. I sprayed (rattle can) two coats, let it dry, knocked it down with 220 grit and repeated, twice. This is the first coat going on. While these parts were drying I rube some oil into the self portraits. Two coats of oil, then a top coat of wax. It’s oil-only in this picture. 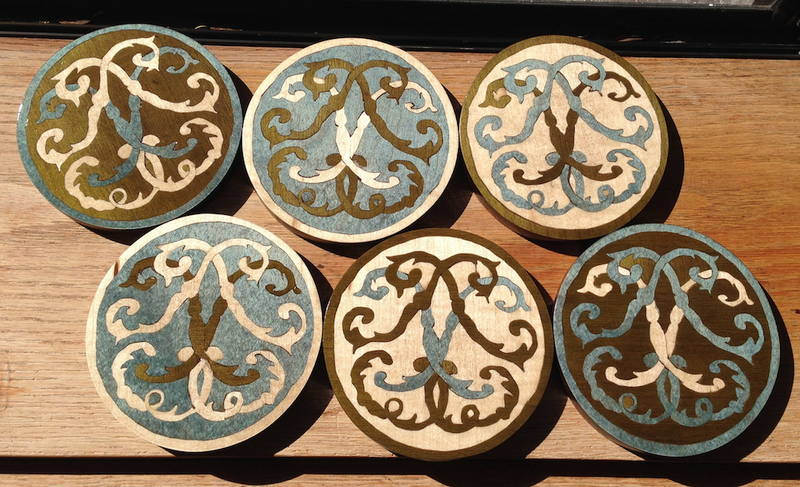 Here are the final coasters drying in the sun. Unfortunately I can see every inconsistency in the sawing, and places where the veneers are reversed (the two green veneers are different shares, for example). Regardless, with a cup of coffee sitting on one, from across a darkened room these will look great! 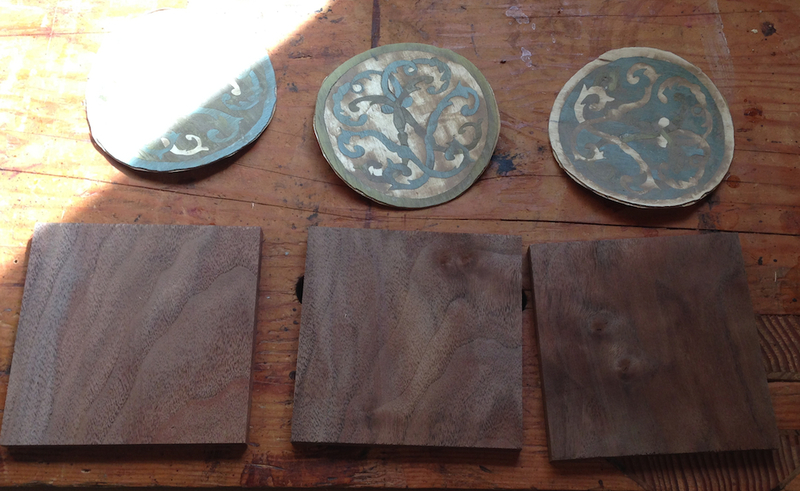 I have a secret desire to get this Marquetry Chevalet done quickly. OK, maybe it’s not secret anymore, but still. The reality is I’m going to run out of Chevrolet car model years to joke about long before I sawing marquetry packets. Oh well, I’ll get it done eventually. 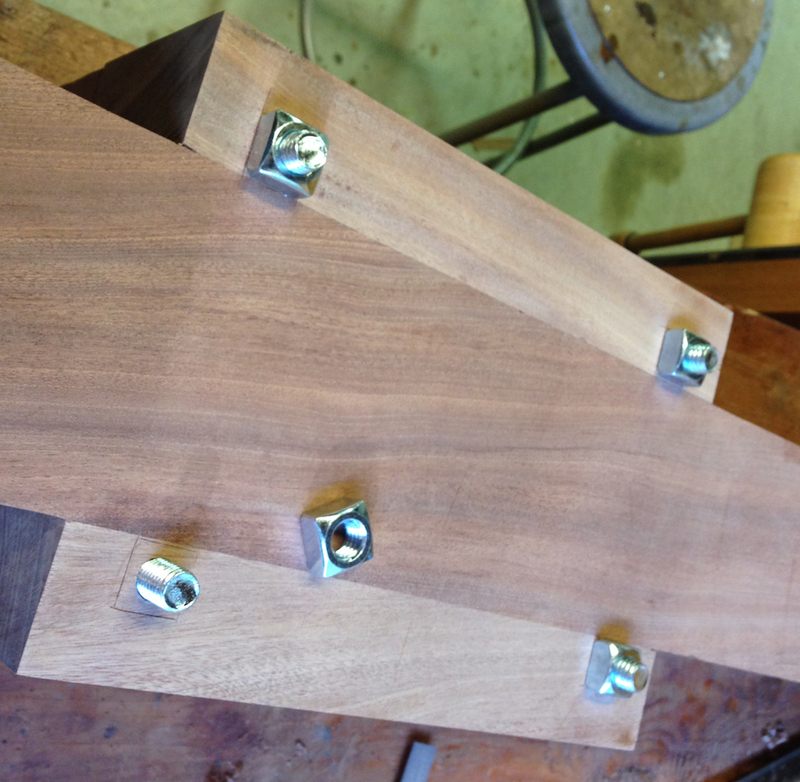 I found a build up blog over on Lumberjocks by Mike Lingenfelter he shows in 8 posts the construction and adjustment process of fabricating his Chevalet. I picked up a couple of tips, but it was also instructional to see how long it took him to do. He started on October 6 2013 and by January 4 he was tuning it to cut correctly. Three months, that probably what it will take me too although I’d like to cut that in half. Fitting the upright to the base took some time, I went slowly so I didn’t make a mess of it. 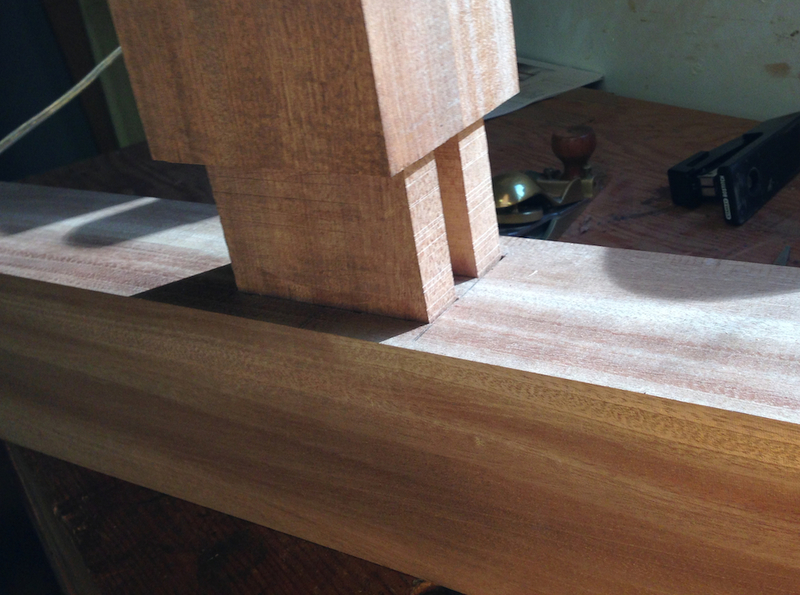 I planed the rough spots off the tenon cheeks, then pared the walls. The finished fit is fairly snug without any gaps along the faces so it should be plenty strong. 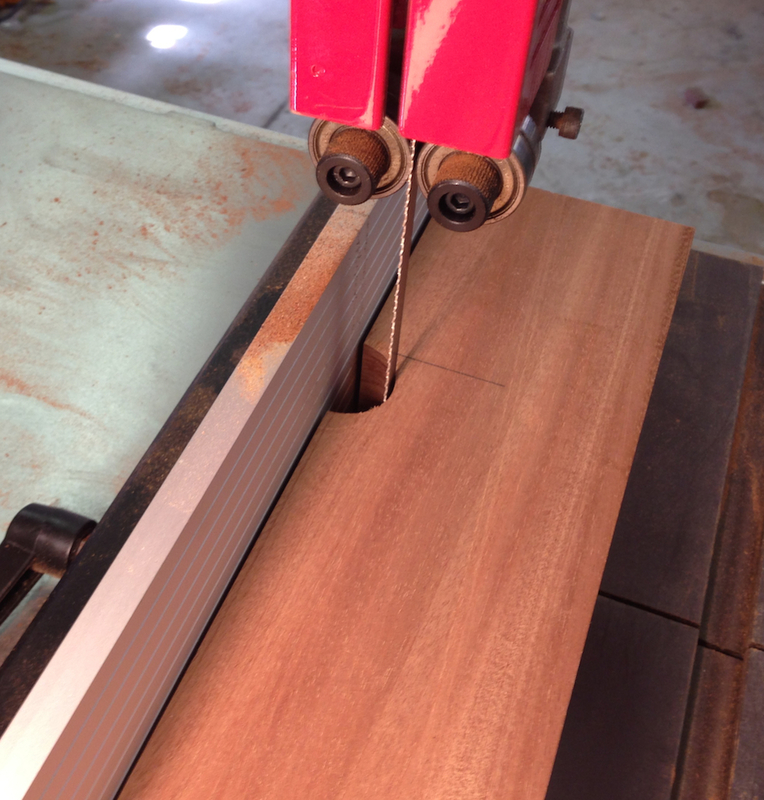 Then I did the cut out detail on the base, drilling holes for the rounded end and sawing out the waste in between. A little work with a plane and a task cleaned that up likely. I sawed the outer corners and blended them in. After it’s all assembled I’ll probably run a round over but around everything to get rid of the sharp edges. Drilling holes to define the “feet”. 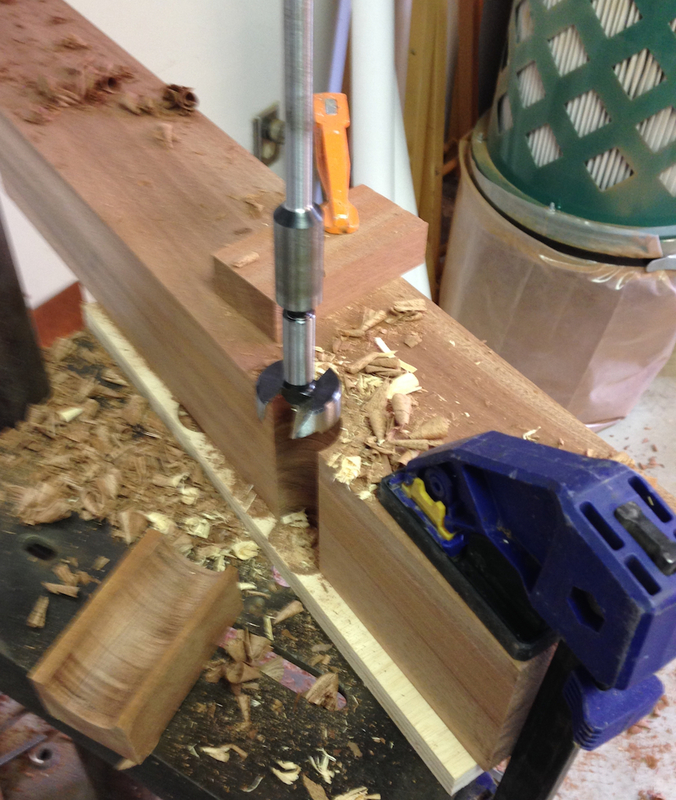 I’d clamped a bit of scrap to support the drill since I was only cutting half a diameter into the base. 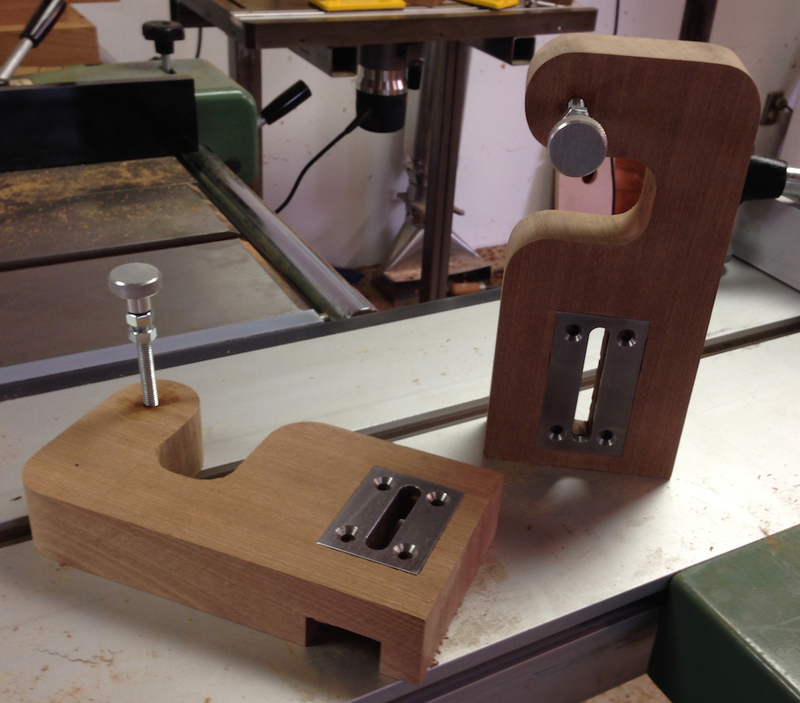 The two remaining steps are to saw out the detail for the top of the upright, and add on the side supports for the saw support clamp. 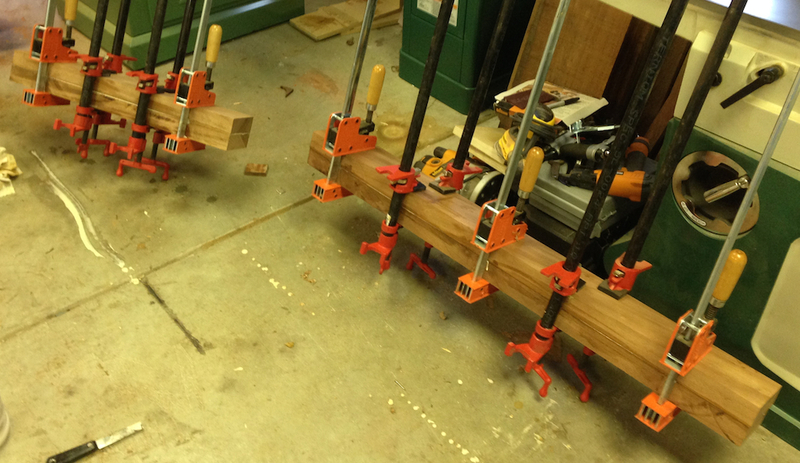 I have the stock prep’d for the support clamps, and laid out the cut for the top, but ran out of time. Another hour or two and this part will be done. 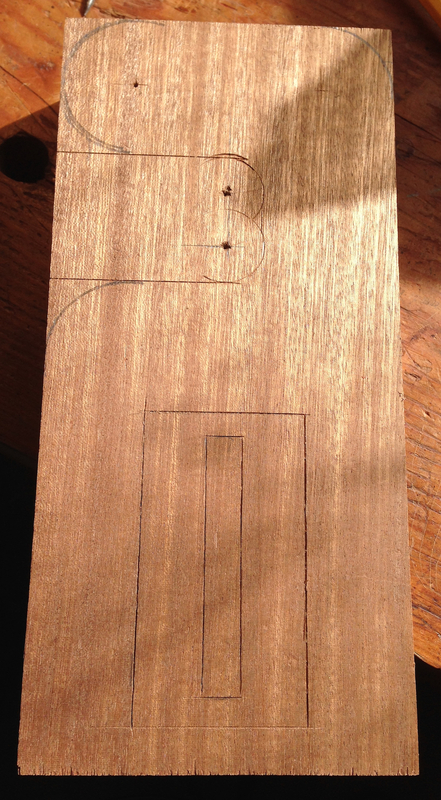 Template for the top of the upright. This shape helps catch the little parts that sometimes pop out of the back of the packet. Last Sunday I got back from San Diego, and in little bits of spare time I’ve been reviewing what I learned in the Marquetry class. I learned a lot, not the least of which is that getting to the point where I can do marquetry well enough to incorporate in furniture is going to take a bit of practice. It’s a bit of a detour from the Arts & Crafts furniture that I am caught up in making, but I’ve decided I want to be able to do a credible job at this so I’ve started building a marquetry Chevalet. The “61 Chevy” is a reference to that, a 61 cm working height Chevalet. The one below isn’t mine of course, but it’s essentially what mine should look like. If you’re not familiar with how the tool works, it’s pretty simple. 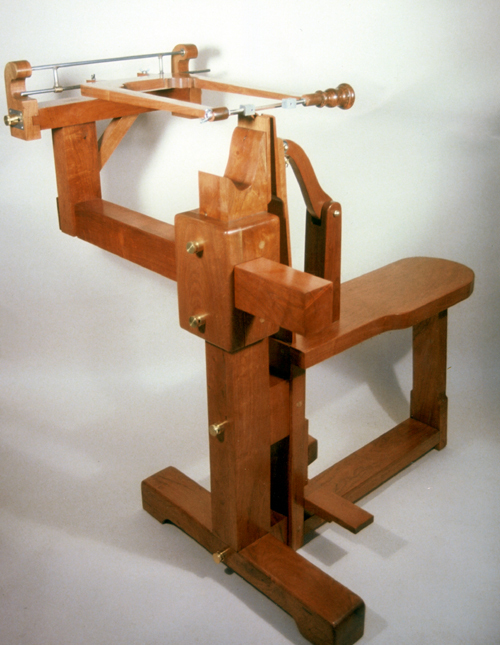 The marquetry packet is held in the vertical jaws with a foot operated clamp, and the saw slides back and forth on a gimbal mechanism that ensures the blade is always square to the face of the packet. The operator is responsible for guiding the saw along the curve, rotating the packet. 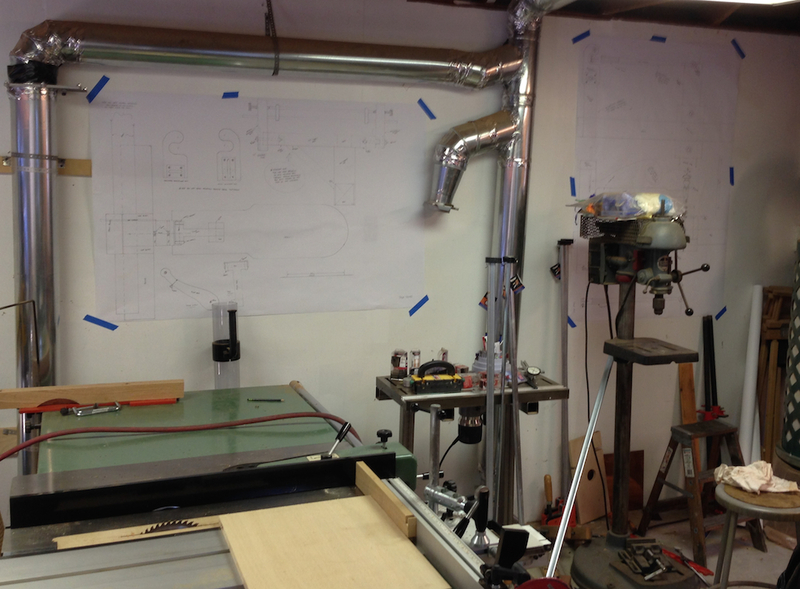 Back in the shop I taped up the plans I got from Patrick Edwards. Generally I don’t like to build from full scale plans like this because there just isn’t room in my shop. Luckily I haven’t built the cabinets and racks I plan to yet. 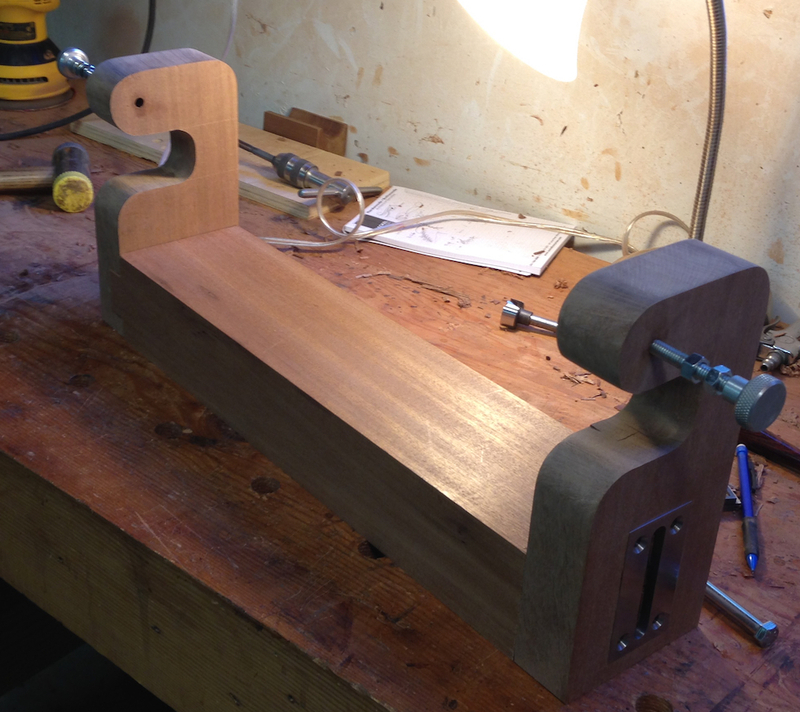 I started by milling up stock for the front upright assembly. 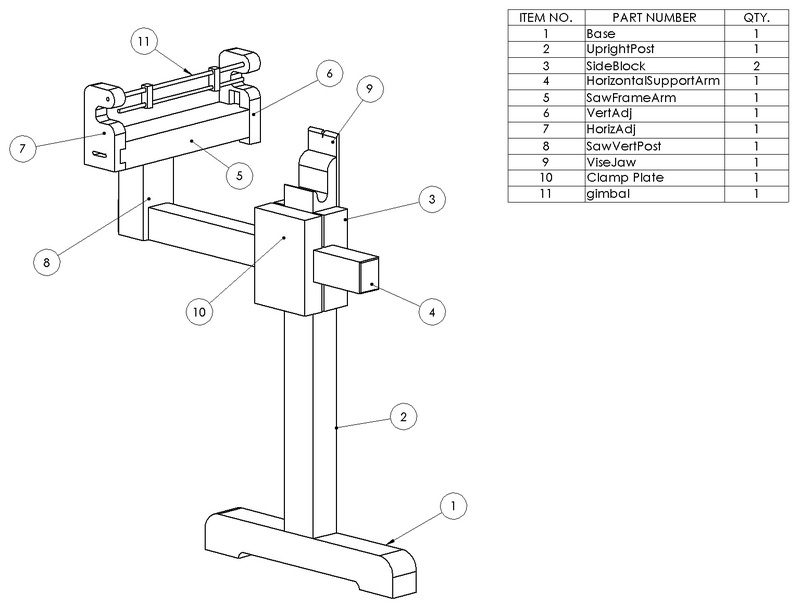 Generally this breaks down into three or four projects, the upright, the saw frame, the saw support and the seat assembly. 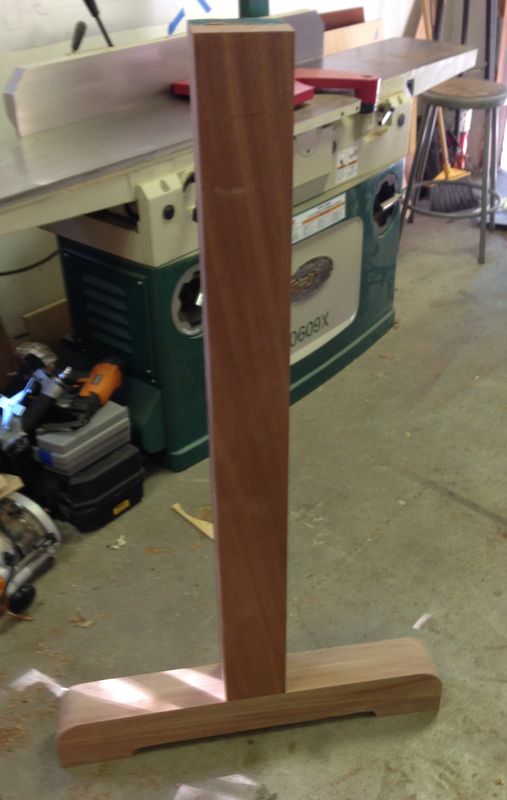 I milled the wood for the upright, glued it to get the thickness I needed, squared it up and started on the joinery. I’m in a hurry to get this done, but it’s going to take me several weeks to get the tool built. 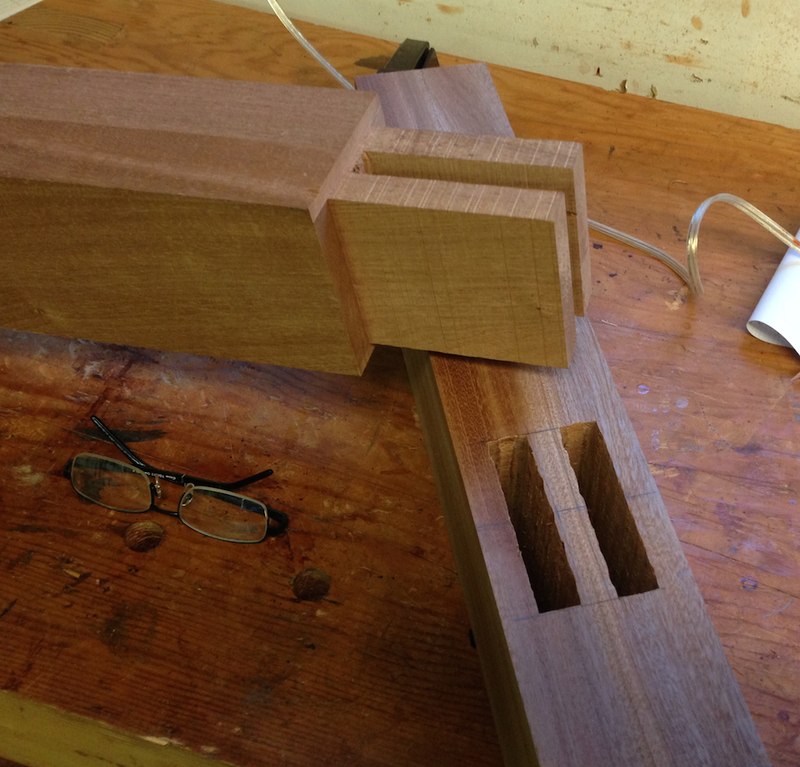 Double mortise and tenon joint roughed in. 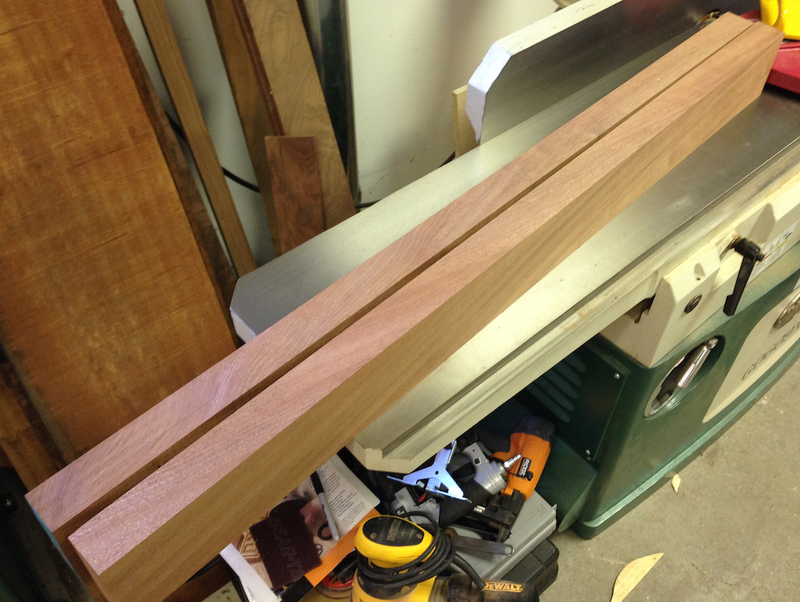 I still have to chop out the rest of the waste between the tenons and fine tune the fit.